In this exercise bulletin you will find a very concise, unique exercise program which will help get you onto the right track toward a championship physique. These exercises are in Vince Gironda’s opinion the best found to date, and any others are only substitutes and variations. My favourite of all the courses! I just really like the format and the no-nonsense advice contained within it. 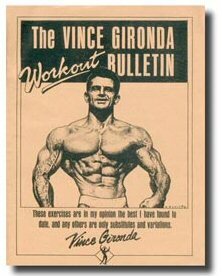 Vince explains his top exercises for each bodypart with wonderful illustrations and descriptions.